The highly anticipated results, comparable to recognizing a doughnut on the Moon’s surface, were unveiled today by the Event Horizon Telescope (EHT) collaboration in seven simultaneous press conferences on four continents. The findings were also published in a suite of papers1,2,3,4,5 in Astrophysical Journal Letters on 10 April. “I was so delighted,” says Andrea Ghez, an astronomer at the University of California, Los Angeles. The images provide “clear evidence”﻿ of a ‘photon ring’ around a black hole, she says. 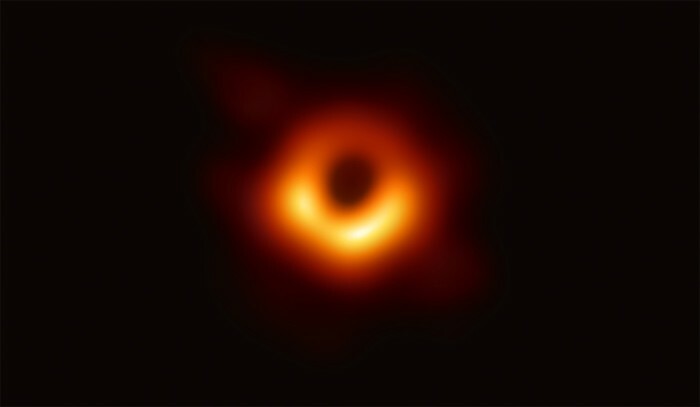 Six press conferences around the world revealed the black-hole images. Nearly a century ago, physicists first deduced that black holes should exist from Albert Einstein’s general theory of relativity, but most of the evidence so far has been indirect. The EHT has now made a new, spectacular confirmation of those predictions. 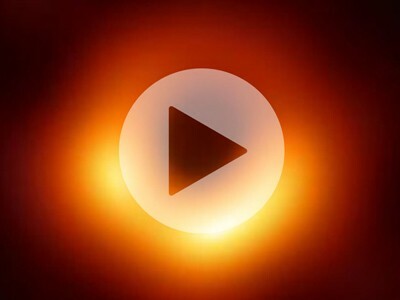 At the Brussels press conference, astrophysicist and collaboration member Monika Moscibrodzka, also at Radboud, said that the measurements so far are not precise enough to measure how fast the M87 hole spins — a crucial feature for a black hole. But it indicates the direction in which it’s spinning, which is clockwise in the sky, she said. Further studies could also help researchers understand how the black hole produces its gigantic jets. 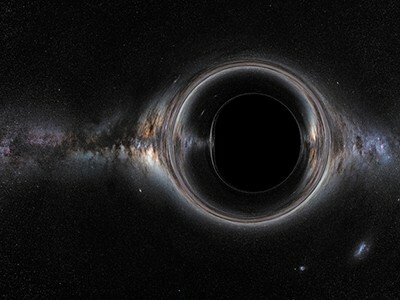 Event horizons are the defining feature of black holes. To a nearby observer, an event horizon should appear as a spherical surface shrouding its interiors from view. Because light can cross the surface only one way — inwards — the globe should look completely black (see ‘﻿Power of the dark’). 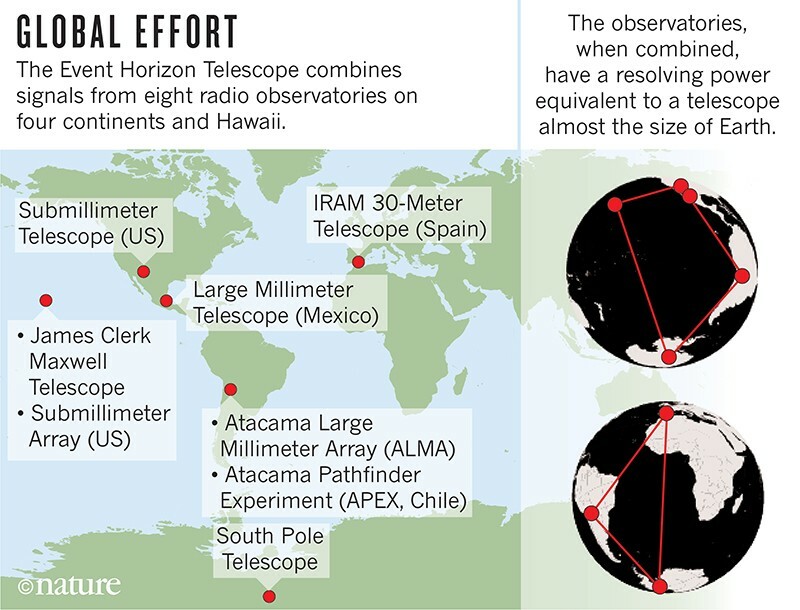 To actually resolve details on the scale of the event horizon, radio astronomers calculated that they would need a telescope the size of Earth (a telescope’s resolution is also proportional to its size). Fortunately, a technique called interferometry could help. It involves multiple telescopes, located far apart from one another and pointed at the same object simultaneously. Effectively, the telescopes work as if they were shards of one big dish. Various teams around the world refined their techniques, and retrofitted some major observatories so that they could add them to a network. In particular, a group led by Shep Doeleman, now at Harvard University in Cambridge, Massachusetts, adapted the 10-metre South Pole Telescope and the US$1.4-billion Atacama Large Millimeter/submillimeter Array (ALMA) in Chile to do the work. In 2014, Falcke, Doeleman and groups from around the world joined forces to form the EHT collaboration. They did their first Earth-spanning observation campaign in 2017. They observed Sagittarius A* and M87 during a two-week window in April when the locations of the observatories are most likely to get good weather simultaneously. 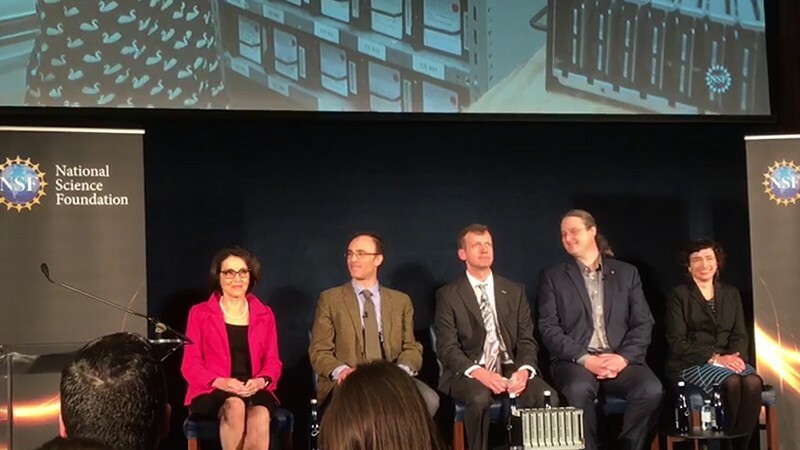 The raw data, which ran into petabytes, were collected on hard disks and travelled by air, sea and land to be compiled at the Max Planck Institute for Radio Astronomy in Bonn, Germany and the Massachusetts Institute of Technology’s Haystack Observatory in Westford. The EHT ran another observing campaign in 2018 — the analysis of those data is still in the works — but cancelled a planned observing campaign this year because of security issues near one of its most important sites, the 50-metre Large Millimeter Telescope (LMT) in Puebla, Mexico. They plan to continue to do observations once a year starting in 2020. An﻿ expanded EHT network could provide detail on what happens inside the voids — “how the world behaves inside black holes, and if it is as we expected it to be”, says David Sánchez Argüelles, a physicist at the LMT. Additional reporting by Emiliano Rodríguez Mega and Nisha Gaind. The Event Horizon Telescope Collaboration et al. Astrophys. J. Lett. 875, L2 (2019). The Event Horizon Telescope Collaboration et al. Astrophys. J. Lett. 875, L3 (2019). The Event Horizon Telescope Collaboration et al. Astrophys. J. Lett. 875, L4 (2019). The Event Horizon Telescope Collaboration et al. Astrophys. J. Lett. 875, L5 (2019).